The doors are always open to the students, families, and community of West Homestead. As the site of our Touching Miami with Love programs to children, youth, and families our West Homestead Site also hosts an office for Catalyst Miami and a satellite office of Wellspring Counseling. 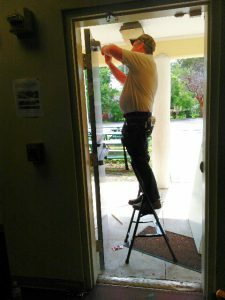 Thanks to funds from the Home Depot Foundation along with a volunteer team led by Mike C., we were able to replace several doors at our West Homestead Site to keep the doors open for all. Our entire 5,000 sq. foot center was built by volunteers over the course of several years in the early 90’s, so it was very fitting that Home Depot required that the installation of the new doors be done by volunteer labor. Our BIG thanks to the Home Depot Foundation, Mike C. and his volunteer team for helping to keep the doors open in West Homestead! All the way from Anchorage, Alaska three faithful volunteers came once again to serve in our spring break camp at TML. One key way they impacted everyone at TML was through the power of prayer. Ron and the entire team prayed with our children’s program coordinator several times for the events of the week, and for our staff and volunteer teams. Nancy spent time everyday praying for each of our children and staff. There were several times during the week when there was a notable change in the atmosphere of the classroom space, a renewal in our staff team, and a joy in our children. A second key impact was through the ongoing engagement of the volunteers. Each day, the team led enrichment and visual arts times that provided children pictures, stories, and even tastes of new foods that introduced Alaskan culture. The team sang with the children during worship times, drove to a field trip to play with the kids, and made crafts side by side with children daily. Many children immediately remembered the volunteers from last year. Last, the daily devotional led by the team to explain the good news of Jesus Christ was powerful. Mr. Ron explained part of the gospel each day, and the team created a special opportunity for all children and staff celebrate communion. It was wonderful to see how it all built on what our March and April TML devo time has been doing to introduce the gospel. There are daily opportunities opening up to remind individual children of the good news of Jesus. We believe it’s because of the powerful impact of the prayers, caring engagement, and truth boldly shared by the Alaskan volunteer team. We are so thankful for Ron, Linda, and Nancy’s presence with us last week. We also ask that you continue to pray for our students when they return home. 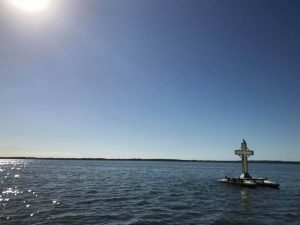 Many youth become close to God at camp, some for the first time, but struggle as they return home because their friends and surroundings are often not supportive of their new life choices. Thank you to our friends at Branches sponsors of OASIS Camp. Family time is important in order to strengthen bonds, and sharing in special events together creates memories that make being a part of a family feel special. But what if you don’t have transportation or you can’t afford the entry price for the popular events in your city? Without a car, it is hard to experience new things and in an expensive city like Miami, it can be next to impossible for low-income families to enjoy new experiences. As Touching Miami with Love seeks to create strong communities, we create opportunities for Family Field Trips each year to provide families in Overtown and West Homestead the opportunity to enjoy our beautiful city. Over the past few years, we have taken our families to the Miami Symphony, Zoo Miami, Universoul Circus, and more. Through the support of partners, we have taken families from both sites for several years in a row to the Fun and Fit as a Family Event at Jungle Island. Hosted by the Food Network, our parents and their children strolled through Jungle Island’s interactive zoological park, watched chefs’ presentations and learned healthy-lifestyle tips for kids. TML’s children explored the food garden, ate free food, and played interactive fitness games, as well as enjoying everything else Parrot Jungle has to offer. Our families enjoyed the time with spent with each other, and who doesn’t enjoy an opportunity to see their favorite celebrity chefs too like Guy Fieri, Rachael Ray, and Robert Irvine! We all know the teen years can be rough for youth. The average teen deals with lots of emotions and talking to teens about their feelings can be difficult. This is true for one of our newer teens in our youth program, Asia. * We share her story as one example of many of how your support is making a difference in the lives of those we serve. Asia joined our youth program at our Overtown Site four months ago. Our youth staff knew there was likely something behind her aggressive verbal attacks. Oftentimes during our weekly Social Skills classes, the youth share about their personal lives, but after months Asia never shared. Her anger was coming from a deep seated pain, but staff were unable to get deeper conversations started. It was instead during Creative Arts in a small group that Asia finally opened up to TML staff member, Tianna. With her head down focused on her project, Asia shared how since she was a very young girl she’s watched her mom struggle with substance abuse. During low times when her mom relapsed, Asia had to live with different relatives and how that made school and friendships difficult. The constant shuffling from home to home, disconnect from friends, and missing out on a healthy relationship with her mom has taken its toll on Asia’s sprit. That night over a simple activity Tianna was able to be the listening ear Asia so desperately needed and trust began to form. Fast forward several weeks and many conversations later, Tianna along with other youth staff from TML stopped in at Booker T. Washington School during lunch. Asia spotted across the lunch room and nearly ran over to them. Tianna was shocked to see Asia so excited as she introduced them to several of her friends. The smile on her face was real and the excitement in her voice such a marked difference from the sarcastic, rude Asia just a few weeks ago. Asia’s turbulent teen years aren’t over and her mom’s road to permanent recovery may still be long and winding, but because of your support Asia can have trusted adults who care about her in her life and a place to come for support.